Some things take planning, but the payoff is worth it. In order to have challah French toast, I first needed to bake challah. 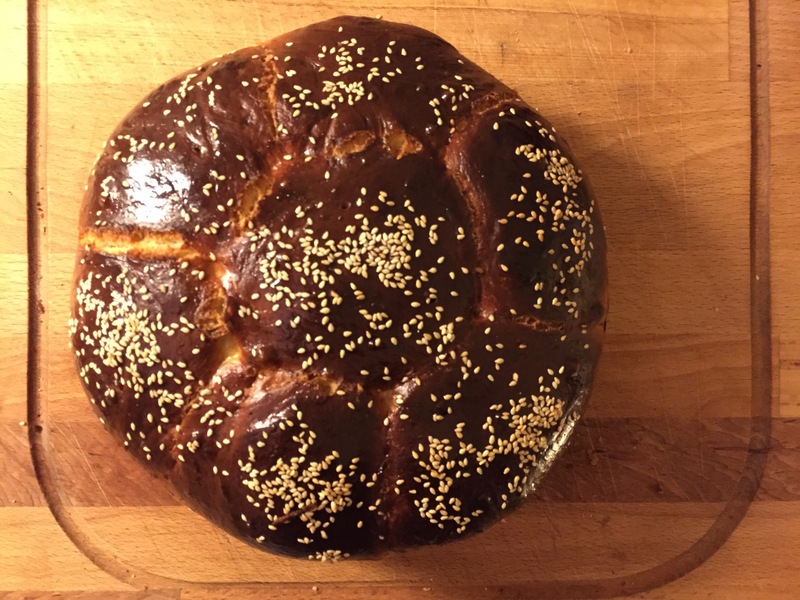 Last year, I decided to try to bake challah. I made it twice back then using fresh yeast, and then at some point bought dry yeast with the intention of making it again. This past Monday, I came home early so I could start on the bread and work during risings. I had hoped to have fresh bread ready when Fronx got home from his Brazilian Jiu-Jitsu class, but a too-cool first rising and a forgotten timer meant the bread went in an hour later than expected. It was midnight when the bread came out, and by then Fronx was in bed. I ate a couple slices and then joined him. The next morning, I took the bigger of the two loaves to the office, since I really only wanted enough to make French toast later in the week, and the little loaf was enough for that. I popped [most of] the little loaf in the freezer until the moment would be right. I am so glad we have this great organic grocery store that is open Sundays near our place. Saturday was too busy for grocery shopping, so after a coffee at home, Fronx and I did some shopping there before breakfast, and also got vegetables and bread for dinner. Once home, I cut four thick slices of the challah and soaked them in beaten eggs, before frying them, two at a time, in my biggest pan. As the second pair of slices cooked, I let the first pair of slices cool slightly before spreading them thick with cream cheese and grating on a generous amount of lemon zest. I used the second pair of slices to complete a sandwich-like stack. I topped each stack with a pat of salted butter, more zest, blueberries that Fronx picked out (I tasked him with selecting fruit), and then drizzled grade C maple syrup all over it. It tasted as glorious as it looked. I LOVE THIS SALAD. I served it to new-to-Berlin Canadian friends, along with rosemary roasted potato wedges, bread and goat milk cream cheese. We listened to CBC Radio streamed, so Fronx could experience The Vinyl Café. Stuart McLean’s style is more extreme than I remembered.